By Margarita Rodríguez Ibáñez, Madrid. Spain. 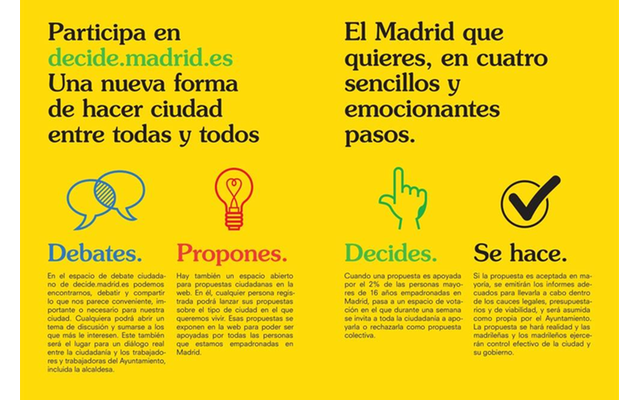 Since 2015, Madrid City Council has been trying to include the citizen vote in participatory processes, using digital platforms and face-to-face tools. In this paper, we ask ourselves whether each instrument of citizen participation can have certain effectiveness depending on the context in which it is used. This paper reflects on the importance of hybrid participation and citizen involvement. The 15M-Movement (May 15, 2011) was the germ of the political party Podemos that won the first seats in the European Parliament in 2014 and in the Spanish elections of 2016 became the fourth political force at the national level. Linked to the mentality of this party, local nodes won municipal elections in 2015 all over Spain. In the case of the city of Madrid, a coalition of Podemos and Ganemos Madrid became the current government team of the Madrid City Council (2015-2019) under the name of “Ahora Madrid” or “Citizen Candidates for Popular Unity”. Ahora Madrid welcomes relevant people from 15M movement, and since their arrival, they have been manufacturing a change of mentality towards collaboration and citizen participation from the Government Participation Area, designing strategies both for the citizens of Madrid and for the associative framework that has been created over the years in the capital. With this mentality in mind, Decide.Madrid appears, working with the open source platform Consul, already implemented in 50 cities and regions that want to replicate the project. Among them, Buenos Aires, Paris, Turin, Jalisco or Valencia. 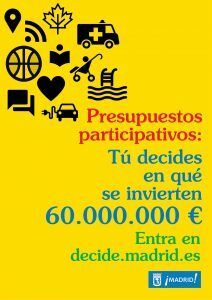 The participative offer of Decide.Madrid has two phases : in the first one citizens can make any proposal that generally revolves around urban infrastructures over a Participative Budget of 100 million euros (of which 30% is for the city and the rest is distributed in its 21 Districts) and also allows contributions on ordinances, regulations or guidelines, that will be taken into account for the final drafting of the rules. After selecting the most voted proposals (through a filter of viability by the municipality), a second phase is started and the citizens can vote restrictively on the favourite ones of the first phase, and at the end they acquire the name of “Citizen Proposals”. In general, Decide.Madrid increases the incentive to participate both in the general participative budget of the city and in each of the 21 districts. On the other hand, it provides citizens with visions and needs on guidelines and regulations at the governmental level. 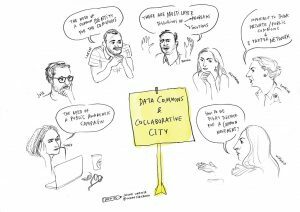 The data on the activity of Madrid’s citizens on the virtual platform Decide.Madrid show a participation of 1.44% according to the latest data published (March 2018), taking into account that 45.535 people out of a total population of 3.166.000 inhabitants have done so, a small percentage compared to the movement in Porto Alegre (Brazil) that began in 1989, and which marked a process of citizen inclusion in a region where the population lived in illegal neighbourhoods and under very poor health conditions. In 1989 and 1990, the first participatory budgets of Porto Alegre achieved a modest participation, until 1991 when it received a strong economic boost, becoming a massive process in which nearly a thousand entities and associations are currently involved. 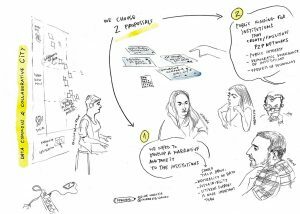 What can we highlight from the initial participatory process in Porto Alegre, and what are the differences with Decide.Madrid? In the case of Porto Alegre, participation arose out of a vital need: to get out of a situation of misery in which the region found itself, caused by poor urban management. On the other hand, the process of participation was physical and not virtual, and was carried out on proposals that had been born in neighbourhood assemblies that met to solve the problems of the community. In contrast, we can say that in the case of Madrid there is no deficiency in urban structures that create health hazards, but this impulse of inclusion of citizens is born to improve the participatory effectiveness of advanced societies with a high welfare system. Thus, the socio-economic level of the place where the participatory inclusion of the civilian population takes place; the resolution of needs through the process; and the environment in which the participatory act takes place, constitute the differentiating elements between these two episodes that stand out. The role of the territory has begun to take centre stage in our globalized culture. The focus is now on building relationships with those who have the same needs and interests as us, as opposed to digital communication that has been tamed and its dangers of control observed. 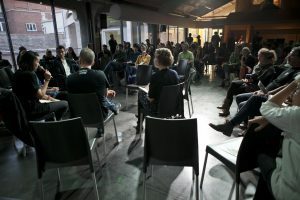 It is true that interaction, interests and the creation of knowledge can happen by electronic transmission but experiences humanly speaking require mainly physical presence and it is under this mentality and perhaps with a change of thinking about the effectiveness and absolute faith on the digital processes, that the city council of Madrid has expanded the participatory concept at the end of 2016 with the Local Forums (LL.FF. 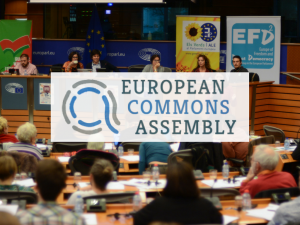 ), information bodies and citizen participation face-to-face and deliberative, luck of neighbourhood assemblies that are located in the 21 municipal districts of Madrid and organized in tables of interest. The LL.FF. 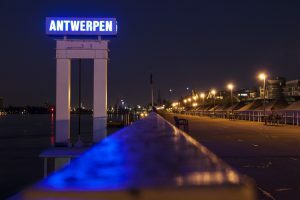 are born to promote the involvement of citizens in municipal policies and to foster dialogue between citizens, non-profit entities of the district and Municipal Boards. Are also spaces for the accountability of the district presidencies to the citizens. To participate in these Forums it is necessary to register (online or in person) between January 1 and March 31 and June 1 and 15, with the presentation of documentation that proves membership in the District. 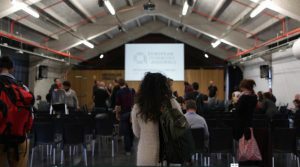 From Decide.Madrid, the debates, petitions and votes, classified by district, would be informed to the deliberations of each of the Local Forums existing in the districts. From the FF.LL., the proposals agreed upon at each of the thematic roundtables would be uploaded to the platform Decide.Madrid for subsequent voting. 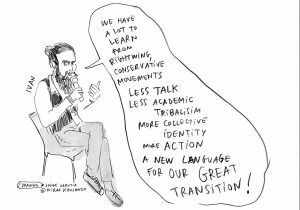 Union of participative tendencies: hybridization of the process and significance. There is a clear distinction between participation and collaboration: the first one can be performed with a simple virtual “click” without any subsequent involvement or direct manifestation, as it is a virtual process with closed elections (yes/no) without the need for deliberation. The collaborative process suggests a deliberative process, sometimes a commitment to work together, exposed to direct motivations according to needs and desires. The collaboration process that we suggest was carried out in the assemblies of Porto Alegre from the beginning, as it is currently carried out in the Local Forums of Madrid. Broadly speaking, in our societies, more weight is given to the virtual as a faster and more globalized means of disseminating information. An example of this is datapoa the application developed by the local government of Porto Alegre in 2013, as a result of the “development” suffered by local government institutions due to the fear of not being part of the global processes of technology inclusion. But it should be stressed that in the face of this cybernetic boom, we should not underestimate the vital importance of the territory in the deliberations on participation and conflict resolution, as in the case of the city of Madrid, which has been diagnosed as more effective in involving the neighbourhood in the decisions of the city itself because it deals with more particular processes than general ones, and thus shows the need to divide the city into intervention districts (served by the Local Forums). In the virtual sphere, citizens’ associations may become more relevant than personal proposals (Decide.Madrid) due to their predisposition to be voted on more, which suggests the “transparency” and lack of objectivity of virtual processes. That while it is true that digital platforms can stimulate participation because they are apparently accessible, they mark a digital divide and at the same time a clear “price of the virtual” for people who do not believe, do not want or cannot use them, causing the appearance of a niche for action, and a loss for local governments that have to recover from a face-to-face level. Virtual things can sometimes influence a depersonalization, because they can respond to a request outside the environment of experiential action, in short, the territory of coexistence. Finding solutions for greater citizen integration in the participatory logic at the local level is very necessary if it is to have continuity. 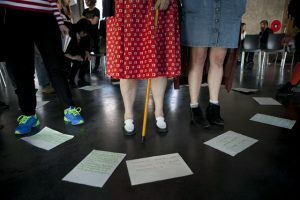 With regard to the participatory process itself, has the concept become popularized and discredited due to the easy customized of the technologies, should the fact of participating or voting technologically imply a greater effort in order to provoke a real importance, that is, that the act implies a real collaboration in the age of the societies accommodated by the technologies? On the other hand, with regard to the participatory panacea, should local governments consider whether the participatory process of civil society, both face-to-face and virtual, should be created based on filters of interest and direct needs of citizens to establish greater involvement of participants, which would make a powerful Institutional Social Network, emerge? On the contrary, should it continue to be an easy process that suggests less involvement, but more numbers that seems that the process is effective? Moreover, should the cost of digital and face-to-face participation be divided equally between budget items, or should one of them be given greater weight? Equally interesting would be to predict whether participatory effectiveness is clearly dependent on the political party that proposes it. In a more ambitious area, it would be important to appreciate that the participation of civil society will take place mainly in the future in cascades of action, i.e. from European, regional, state or local institutions. It would be important to know whether we should use virtual processes in deliberations in spaces with a large population in which the experiential processes have no place, and preferably use face-to-face processes in local actions. The evolutionary process of these actions may be able to discern between the participation and collaboration of civil society, which will depend on the issue proposed to it and its need for its implementation.